"I am a bookworm, the daughter of a bookworm, but always assumed that I couldn't be a published children's writer because I wasn't white and dead. In my early 30s, I found out about Malorie Blackman, and thanks to the Pig Heart Boy I finally found my real voice" - so says Patrice Lawrence. BookTrust exists to get children reading, regardless of their race, colour or background. We want all children to experience the transformative life chances that result from engaging in reading. Reaching out to everyone with books is more than just a vision for us, it's what we do. But finding books that accurately reflect the diversity of families across the UK is difficult - we just don't find enough. Why do we care so much? We know from years of experience that representational voices in children's books are important for all children from all backgrounds. Books are a window onto the world, a child's first access to culture, and all children deserve to hear a range of voices and perspectives. As has been said many times before, books are also mirrors, reflecting and articulating our own experiences - and we are depriving many children of this experience in the books they read. We know that children who don't see themselves in books are less likely to become readers and therefore less likely to become the writers of the future. So, in the longer term, we are all deprived of new voices and new talent. 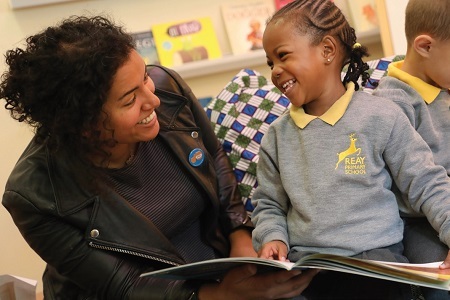 In April, BookTrust publishes BookTrust Represents, a major piece of research with University College London, investigating the number of authors and illustrators of colour published in the UK over the last decade. This groundbreaking piece of research is the first of its kind and provides a detailed picture of trends in authorship. It shines a light on the fact that in the past 11 years, fewer than 2% of all authors and/or illustrators of children's books published in the UK are British people of colour, and it describes the experiences of a range of writers and illustrators in their journeys to publication. Our investigation gives us an accurate baseline from which to measure changes over time, and the data to inform our future work and our investment in making effective change. We know that the book trade is aware of the problems that exist around diversity and representation, and of the huge commercial opportunity this presents to the industry. We understand that many organisations are working hard to rectify the problems and that a number of initiatives already exist to increase publishing diversity, which we enthusiastically support. We also know more that needs to be done. Children need and deserve to see themselves in books, and to have access to a rich and diverse range of voices. If they do, it can be life-changing. "When I go into schools to read, the response from kids of colour is incredible," Nadia Shireen says. "You can see their faces light up with possibility. I underestimated the importance until I saw it with my own eyes. There's that phrase, 'You cannot be what you cannot see.' It's important that all children understand that people who look like me can do jobs like this. It's not just for posh white women or old white guys with beards." This is why we're supporting the publication of Speaking Volumes' Breaking New Ground brochure, which launched at the London Book Fair and which showcases 100 wonderful children's writers and illustrators of colour. Following the launch of our research, as part of our BookTrust Represents project, we will be promoting these writers and illustrators to schools, bookshops and festivals across the country. BookTrust is passionate about helping to create a real change across the ecosystem of the books industry. We are eager to support and encourage any efforts that help to move this forward, so that all children will see themselves accurately represented in books. We pledge to continue our work with a variety of authors, illustrators and influencers who can help us widen the appeal of reading, so that all children, regardless of their colour, background, ethnicity or culture, see reading as "for them". Because every single child deserves to discover the magic of a story. Jill Coleman is director of children's books, BookTrust, which each year reaches 3.4 million children across the UK with books, resources and support to help develop a love of reading. To find out more go to: booktrust.org.uk/booktrustrepresents.